This is fail proof as the Lobster is already cooked. I bought a frozen whole lobster from the supermarket recently. The lobster shell has been cracked so its easier to serve. 1. Blanch lobster in hot water for 1 minute. Drain, remove flesh from the belly. 2. Diced the lobster meat into cubes. 3. On a large plate, add the fruit cocktail, mangoes on it. 4. Finally add the lobster meat. 5. 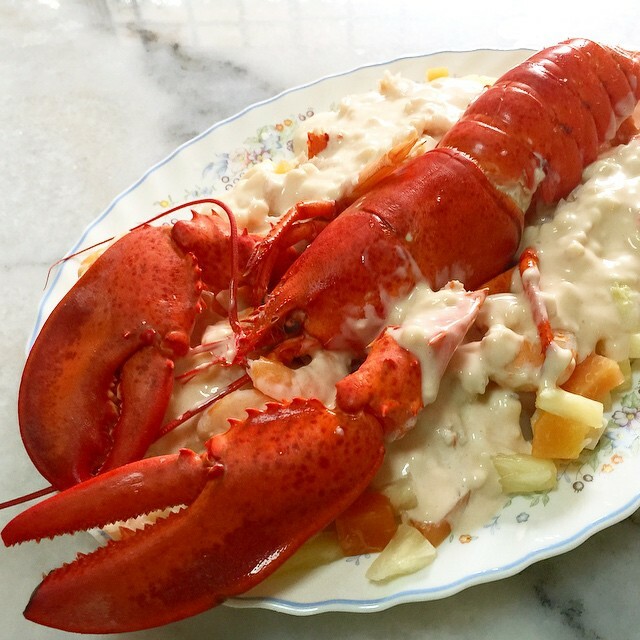 Drizzle the salad sauce over it and top it with the lobster shell for presentation.